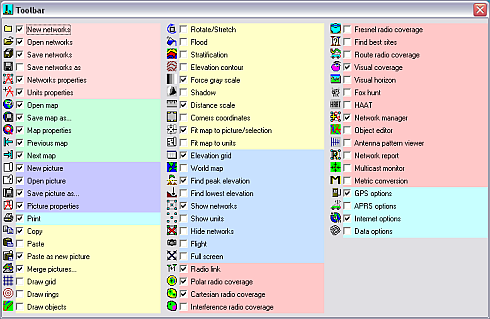 With this function you can enable or disable buttons in the tool-bar of Radio Mobile. It is performed by checking or un-checking the check-box to enable or diable the button in the tool-bar. The function of the button is briefly explained next to the button and the check-box. A more detailed view is found at Quick Reference - Toolbar.